Located an hour's drive east of Aqaba in Southern Jordan, Wadi Rum was the spectacular setting for Nabataean temples, villas, and baths, as well as for the movie Lawrence of Arabia (later pages). 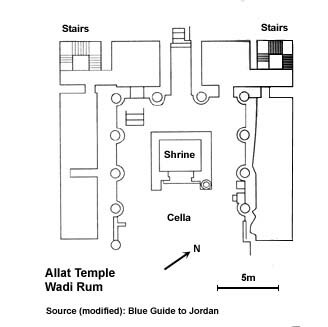 Seen here is a temple to Allat, the Arabian goddess who was a consort of Dushara and who was identified with Athena. The temple is dated to the early first century AD, reign of Aretas IV. Its plan is similar to other Nabataean temples, like the Winged Lions temple at Petra, or the temple at Khirbet Tannur. The photo looks west, towards the shrine. Engaged columns surround the cella. They were originally painted in red, blue, and yellow.